Connectional maps of the brain may have value in developing models of both how the brain works and how it fails when subsets of neurons or synapses are missing or misconnected. Such maps might also provide detailed information about how brain circuits develop and age. I am eager to obtain such maps in neonatal animals because of a longstanding interest in the ways neuromuscular circuitry is modified during early postnatal life as axonal input to muscle fibers is pruned. Work in my laboratory has focused on obtaining complete wiring diagrams (“connectomes”) of the projections of motor neuron axons in young and adult muscles. Each data set is large and typically made up of hundreds of confocal microscopy stacks of images which tile the three dimensional volume of a muscle. As a first step to analyze these data sets we developed computer assisted segmentation approaches and to make this task easier we have developed second generation “Brainbow” transgenic mice that, in essence, segment each axon by a unique fluorescent spectral hue. Once the axons are segmented, we have been able to graph the connectivity matrices that result. This effort has led to new insights into the developmental processes which help the mammalian nervous system mold itself based on experience. Analysis of these complete muscle connectomes show a striking single axis gradient of connectivity that we think is related to the ordered ranking of neural activity in axons (the “size principle” of Henneman). In brain however, as opposed to muscle, the high density of neuropil is overwhelming, which has precluded using the confocal optical approaches that have worked in the peripheral nervous system because there are too many neural processes in each optical section. We have thus developed of lossless automated physical sectioning strategy that generates thousands of ultra thin (~25 nm) sections on a firm plastic tape. We have developed a thin-section scanning electron microscopy approach to visualize these sections at 3nm lateral resolution. This method makes large scale serial microscopic analysis of brain volumes more routine. We are now focused on developing an automated pipeline to trace out neural circuits in brains using this technique. JEFF LICHTMAN is the Jeremy R. Knowles Professor of Molecular and Cellular Biology and Santiago Ramon y Cajal Professor of Arts and Sciences at Harvard University. He received an AB from Bowdoin (1973), and an M.D. and Ph.D. from Washington University (1980) where he worked for 30 years before moving to Cambridge in 2004. He is a member of the newly established Center for Brain Science. 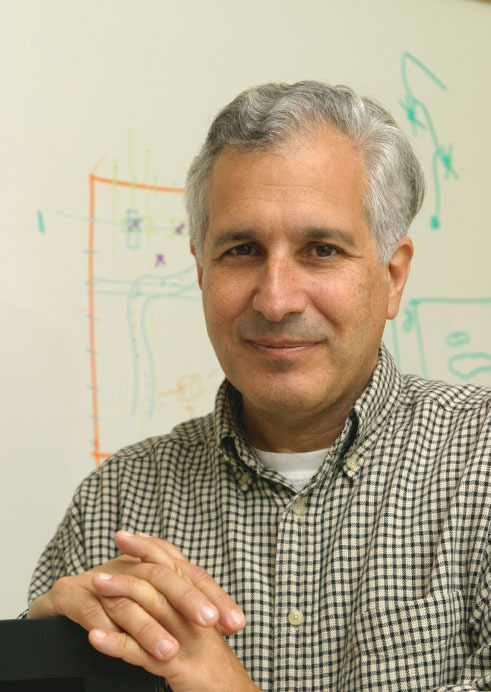 Lichtman’s research interest revolves around the question of how mammalian brain circuits are physically altered by experiences, especially in early life. He has focused on the dramatic re-wiring of neural connections that takes place in early postnatal development when animals are doing most of their learning. This work has required the development of techniques such as “Brainbow” transgenic mice to visualize neural connections and monitor how they are altered over time. Recently his efforts have focused on developing new electron microscopy methods to map the entire wiring diagram of the developing and adult brain. This “connectomics” approach has as one of its aims uncovering the ways information is stored in neural networks. President Larry Millstein called the 2333rd meeting to order on April 25, 2014 at 8:24 pm. He announced the order of business, introduced new members to the Society, and talked about the 7th meeting of the Society held in 1871. The topics were an exhibit on some "dust charged with organic matter from Armenia," a report on the value of the Alaskan acquisition to the US and a work on the number of vertebrae in fish. The minutes of the past lecture were read, corrected and approved. The President then introduced the speaker for the evening, Dr. Jeff Lichtman. Dr. Lichtman started by describing structural biology, which investigates the atomic structure of molecules (for instance, enzymes) in order to understand how they perform their functions. The start of structural biology was studying organs. Initially, similarities were noticed between the organs of different animals. For instance, kidneys or stomachs were easily recognizable. We probably understood how the heart functioned first, since its beating can be visible to the naked eye. For other organs, while we may have known what they did, we did not always know how they did it. We started to recognize structural motifs, like the nephron filters in the kidneys, and to detect physical abnormalities as causes of disease. These approaches worked well enough many organs except for the brain. In the brain we did not know about the cellular motifs, did not know what "normal" looked like and could not identify physical abnormalities which caused malfunctioning in the thought process. Dr. Lichtman presented the motivation of his work on connectomics as a way to try to look at the brain just as we study the other organs, structurally and functionally. Dr. Lichtman then presented the reasons why the brain is so hard to understand. First, while there are five types of liver cells and maybe ten types in the kidney, there are about fifty types in just the retina; the correct number is still under research. The cerebral cortex also has different types, and the cerebellum, and the spinal cortex. and these cells do not exist anywhere else in the body. The brain also has a much higher level of functional diversity than the other organs. Second, the brain has organization at many scales. A human can survive with one kidney or one lung, but not with any significant damage to the brain. There is no extra "brain capacity;" every part has its own distinct function. This division of labor applies at smaller scales as well as large scales. For instance, within the cerebellum, the gray matter and white matter have their own division of labor. Within the gray matter, we find a type of cell, the pyramidal neuron, found nowhere else. Each such cell is set in a hugely complex network, receiving and sending information to thousands of other cells. When we examine the dendrites of this single cell, these are also structurally complicated; the dendrite is covered with spines where the incoming axons or inhibitory neurons make contact. Where each spine makes contact with an axon, the axon is filled with globules of neurotransmitter. Gathering this multi-scale information is difficult. fMRI has a resolution of about 1 mm3, and can monitor which areas of the brain light up when, but to observe where information passes from one cell to the other we need a resolution of 100 nm3, a trillion times smaller. And we need to understand things in every scale in between. Thirdly, while the brain came into existence from DNA instructions just as the other organs, in the brain there is more to it. In organs, genes lead to structure, which leads to function; but a lot of brain functions cannot come from genes. For instance, riding a bike: Learning it is more difficult for someone older, but once it is learned, it stays in the brain. Practice and use of the brain can generate a function which must be stably maintained in the structure. Structural differences which arise this way create a loop in the gene-structure-function path, which has nonlinear effects. Since we have to learn things that animals are born with, and some skills take take decades to master, such feedback loops are stronger in humans. All our memories arise from our experiences, our use of our brains, and become part of our brains' structures. Dr. Lichtman gave the definition of an "engram" as the physical instantiation of a memory. He stated that this is his main research interest: How experiences are physically represented in the brain. Dr. Lichtman then gave an overview of the history of techniques applied to this question. In 1873, Golgi discovered a stain for the brain that only labels certain cells, but stains those completely. This black compound of silver nitrate and potassium dichromate was used by Cajal, who made great drawings of nerve cells. He also theorized how information would flow: cell body to axon to next dendrite to its cell body to its axon to dendrite... This is a very compelling idea and is correct to a first approximation. We still draw very similar diagrams, adding inhibitory cells, which were not visible in Golgi stains. In genomics, mapping out the massive complexity of genes in detail turned out to a really powerful tool for understanding. Dr. Lichtman posed the question: Can we do the same thing for brain structure? He then introduced a new term: "Connectomics", a field of research that attempts to construct a wiring diagram of neural circuits. It is a branch of biotechnology, involving computer-assisted image acquisition for structural mapping of the neural circuits for the full nervous system, with the data organized in databases, with applications in neurology, psychiatry or fundamental neuroscience. Dr. Lichtman pointed out that Golgi stains are too undifferentiated for this work. We have gene-engineered the green fluorescent protein from jellyfish to be expressed in different colors, each of which can label an individual cell. Dr. Lichtman showed pictures from different regions of the nervous systems of mice, in which cells labeled with different colors were visible. By using confocal microscopes, it is possible to trace the "wires" up and down in the structure. Dr. Lichtman stated that they started to untangle the "wire diagram" by focusing on spinal motor neurons. Tracing the neurons to muscle cells, we can find the places where the synapses from axons make contact. These are where nerve cells from the spinal cord terminate and release neurotransmitters to cause contraction. In an adult mouse, each muscle fiber has one axon connecting to it, and the unique coloring identifies which neuron's axon the neuromuscular junction is from. Each neuron may branch to different muscle fibers, but each muscle fiber has only one connecting neuron. Dr. Lichtman then showed a network of fifteen axons addressing the interscutularis muscle ("ear-twitching muscle") of a mouse. He pointed out that the wiring diagram is not mirror-symmetric to the other ear, even though both muscles have the same function. In fact, every instantiation for this wiring diagram is different for every animal, although it would be the same between different insects or worms of the same species. Furthermore, the wiring diagram looks sub-optimal, with many strange loops and hairpin turns. All this variability and sub-optimality arises from the development process. Dr. Lichtman demonstrated that wiring diagrams for newborns are much more complicated than those in older animals. A particular example showed an axon of a newborn mouse, compared with the same axon at 2-weeks of age. The axon innervated very few muscle fibers at 2 weeks, where at birth it innervated about 85% to 95% of muscle fibers present. We have dramatic amounts of nerve branch pruning in early life. In the at-birth structure, multiple axons are innervating the same neuromuscular junction. As the animal ages, all but one neuron retreats from each junction, and more than 90% of synaptic branches are eliminated soon after birth. While the animal has an all-to-all wiring diagram at birth, at 2 weeks it is a sparse diagram. Dr. Lichtman then turned to the question whether this same pruning process happens in the central nervous system as well and described the experimental technique his team has developed to decipher the connections in the extremely dense brain tissue. The system works like a tape player. 30-nm thick sections of the cerebral cortex are shaved off and picked up by a conveyor tape, which is then cut into strips and arranged on a silicon wafer, yielding a linear library from the original 3-D structure. The sections are imaged as 100,000 x 100,000 pixel images with 4 nm resolution. 10300 such sections is converted to about 100 TB of data, which was accumulated over 100 days. However, this still represents a tiny brain section, about a single grain of salt. Dr. Lichtman described further development work to speed up this process. The research team is collaborating with the company Carl Zeiss to build the fastest electron microscope ever developed, with 61 beams, capable of imaging 2 gigapixels per second. Working with engineers, the research team has developed techniques to segment and color the electron microscopy images automatically. Errors still have to be checked by human researchers. 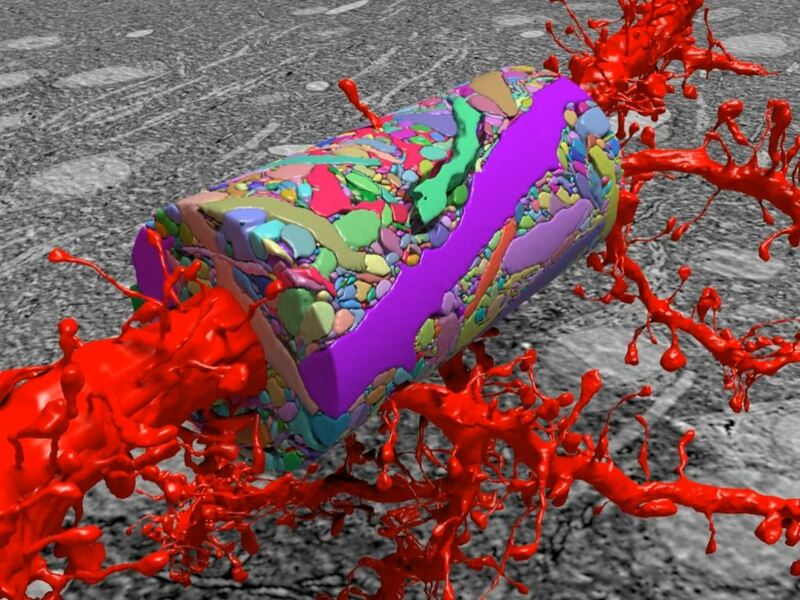 Once coloring has been done, the same structure can be traced from section to section to recreate the three-dimensional dataset, looking at cross-sections 30-nm at a time with this thin-section scanning electron microscopy technique. Dr. Lichtman showed the structural complexity of an area in which they have mapped everything completely. But this is only one billionth of the size of the mouse brain. In a similar region they have counted 696 individual axons, 83 dendrites, and 774 synapses, which gives an idea of how enormously complex the complete brain structure would be. However, there is still underlying structure to be deduced. Which particular axons innervate which particular dendrites is not random. Connectivity clustering is observed: As the same axon meanders around and comes across the same dendrite, it makes multiple connections. There are rules, which are probably dependent on learning. Dr. Lichtman stated that he grew up in an age of big ideas, but very little information, which seemed to make it easier to understand things. Now we are in the era of big data, but we do not yet know how to think in big ideas with big data, which is what Dr. Lichtman believes we need to learn. After a question/answer period, Mr. President thanked the speaker, made the usual housekeeping announcements and invited guests to join the Society. At 10:11 PM, President Millstein adjourned the 2333rd meeting to the social hour.